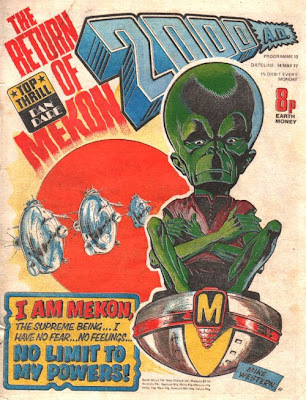 Cover: Yeah, so apparently this Mekon guy from the last Dan Dare is somehow important. Important enough that Mike Western came in to do a drawing of him. Or his real name is Mike Western. Or that’s a tag which identifies the owner of that hoverplatform as Mike Western, meaning that the Mekon was smart enough to steal it from someone with the same first initial as himself. Seriously, though, since this bills the story as ‘The Return of the Mekon’, he’s obviously someone I’m supposed to have heard of. Hopefully that will be covered in the issue, saving me from doing any research. 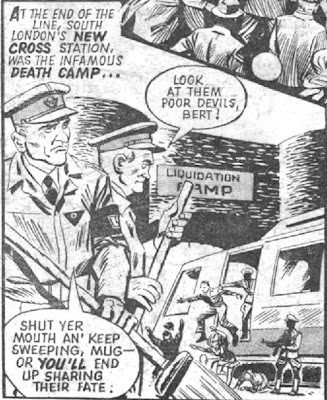 Yeah, discarding all pretense or euphemism, it’s identified as a ‘liquidation camp’. You know what the really sad part is? The prisoners probably had to make that sign. Right outside the New Cross death camp, Bill Savage and his buddy Silk tell a friendly ‘Eel ‘n Pie stall’ (oh god I hope that’s not a real thing) owner that she’d be smart to move her stall that night. She protests that she’s been in that location for 20 years, and she doesn’t plan on moving. Bill responds that unless she wants her food to be scattered all over south London, she’ll move. Of course, and maybe I’m just being over-sensitive here, doesn’t it seem like the time to move your stall would be back when they turned the station you operate outside of into a death camp? Seriously, who is she selling eels to? The concentration camp guards? Because I can’t imagine a lot of tourists hanging around the place where they’re tossing Britons into giant furnaces. The next night Savage and crew waylay a group of cleaners and steal their uniforms. Then, as the next group of prisoners are being loaded onto the trains, the Mad Dogs attack! Officers are pushed in front of trains, engineers are gunned down, and prisoners are set free. Then a truck pulls up outside and the Mad Dogs start loading explosives into the train – the goal? To turn it into a giant rolling bomb! Over at the camp the Kommandant is annoyed that the ‘Death Train’ (yes, he actually calls it that) is three minutes late. Of course, his annoyance turns to terror when he sees that the train isn’t stopping. It jumps the track and detonates a moment later, another victory for the resistance! These Volgs can not catch a break. I can’t remember the last time the actually succeeded at doing something evil. I’m almost starting to feel sorry for them. The dino siege has dragged on for three days, and tempers are flaring. Reagan’s especially when he discovers that the Flesh Controller has been tossing rejected, rotting meat out for the flesh-eaters in the hopes of calming them a little. Reagan is furious – he knows that giving them meat will just convince the carnivores that there’s more meat to be found within, and prolong the conflict. With Claw Carver acting as a yes-man, however, FC ignores Earl’s warnings. In fact, the’s more worried about the fact that the siege has prevented them from moving any more dinosaurs in to be processed. Out on the line, Old One-Eye has been observing the lasers, and studying their effectiveness. With her primitive kitten-brain, she’s determined that they can only shoot a few dinosaurs at a time. Using her mighty roar to whip up the huge pack into a frenzy, she drives all the dinosaurs into one area of the fence at once. Plenty of dinosaurs are killed, but the crowd is able to knock the laser tower down, breaking the line! The rangers rush to the defense of the base, and the FC finally relents to Earl’s demands and shuts down the fleshdozers so that every hand on base pick up a gun and blast some dinos. This proves to be a foolish decision. Remember those dinosaurs from last week? Yeah, it seems they’re not happy about the fleshdozers shutting down. While all the other rangers are off fighting, a single night watchman has remained behind to watch a movie, as he explains in one of the great ‘Wait – who’s he talking to?’ moments in the history of fiction. Yup, he’s watching Jaws. And apparently such a big fan of the movie that he knows the shark’s name is ‘Bruce’. That’s some specific trivia for a 24th-century person to have access to, isn’t it? Anyhow, our lonely cinephile finds himself the star of his own disaster movie when one of the giant spiders tears a hole in the floor, climbs out, and bites him fatally. Next time? Spiders on the Rampage! Okay, I’m a little concerned – I had a bit of Flesh in collected, colorized North American reprints, and if I remember correctly, the spider stuff that starts next week is really creepy. Well, if you’re terrified of spiders, that is. Looks like I spoke too soon. The Harlem Heroes are back in their original spot, and I can only assume that Dredd has been banished to the back pages once more. We find our favorite Aeroball team watching the footage of their last game on a vid-screen. Giant finally figures out where he recognizes the monster’s voice – they’re able to identify their attacker as Artie Gruber, back from his terrible injury, and profoundly pissed at the Heroes. 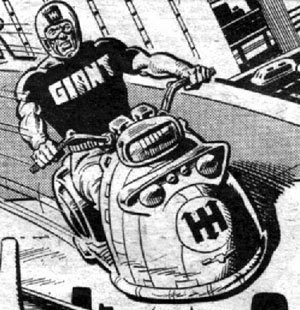 Notable in the art is the act that Giant is now being drawn with the scar on his right cheek – good continuity! 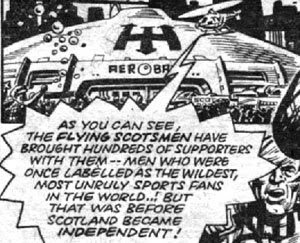 With no leads as to who hired Gruber and paid for his reconstruction, The Heroes decide to put their worries aside and do some research on their next opponents, the Flying Scotsmen of Aberdeen. It seems the Mega-City 1 museum of sport has a 3D display on the team, and this is their chance to perform some due diligence. The only question left is – how do they get there? On hover-moped, of course! Oh, Giant, do you not want me to take you seriously? Is that it? The museum is full of important historical displays. All the people who have run a 3-minute mile, the winners of the 2001 Trans-Siberian Tank race, and, of course, the greatest boxers of all time, both human (Ali), and mutant (Rocky-3028). In the 3D room, the Heroes get a quick history of Aeroball in Scotland. It seems that there was an oil boom in the 80s, and when it ended the country fell into a deep depression. The oil workers, looking for something to do with their time, turned a few old derricks into a aeroball stadium and started playing. Their descendents are now some of the toughest aeroball players in the world! As evidenced by ‘Red’ MacArdle, a Flying Scotsman who swoops in, surprising the Heroes just as their movie is ending. He says he just wanted to give them a little scare, but Slim takes it personally and tries to pick a fight. Looks like there’s going to be some bad blood at the game later that week! I don’t get it – are they more unruly now because they’re an independent nation, or less? This is incredibly unclear. The Scotsman start with a flyby, showing off their special skill – they mess with the fuel mix in their packs so that when they afterburn, it leaves a black cloud in the air that people can’t see through. Does this game have any rules at all? Or standardized equipment? Can you imagine a football team showing up for a game with spikes all over their helmets and shoulder pads, announcing that they’re just ‘our away uniforms’? Giant is a little wary – the Scotsmen are the first real threat they’ve faced. Why? Because they’re from poverty just as bad as the poverty in Harlem! And as everyone knows, the best athletes are poor people, because they want it more! A few more fun letters this week, as one reader playfully alludes to John Probe’s simliarity to a certain bionic gentleman from America, and two opposing letters announce their love/hate for the new version of Dan Dare. Another letter mentions a UFO that writer saw, and Tharg suggests that it was flown by the Dictators of Zrag, again referenced to as being his arch nemeses. In the distant future of the year 2177, England has been turned into a floating island park that the whole galaxy uses as a tourist destination. It’s there that Dan arrives, presumably after checking in with Monday’s family on Mars, although that’s not made explicit. Wandering through the glens, Dan wonders just how he’s going to get back into space so he can get to the bottom of the whole ‘attack on Earth’ thing. 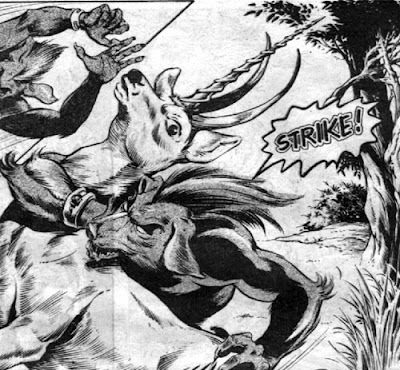 During this reverie he spots a wolfman about to pounce on a strange deer/unicorn thing, and rushes in to save the day. After subduing the wolfman, who turns out to be named ‘Rok’, Dan discovers that the creature is a crewman on the spaceship Titan, and that they need a new navigator. He’s pretty sure that Dan can get the job easily, since he’s a famous spaceman from the distant past. I’m not quite sure about the logic here – sure, if Billy Bishop thawed out tomorrow I’d think it was profoundly cool and want to meet him, but that doesn’t mean I’d hire him to fly a 757. Realizing that this is his chance to track down the Biogs’ homeworld, and the people who pointed them at Earth, Dan volunteers. Meanwhile, elsewhere in deep space we find a prison ship with a single prisoner… the Mekon! Still drawing a blank on this one. Anyhow, his ship is boarded by a group of space-criminals, led by the nefarious Two of Verath! So that’s going to be their thing. One’s a feral monster, the other one a scheming guy. Clever. So, are they actually a race that’s like this, or were they brothers who were merged in some kin of a science accident? I hope it’s the second option, but somehow I think option 3: “We never find out” is much more likely. The Mekon shows off by killing one of their soldiers, and then the brothers offer to let him join their criminal gang. The Mekon thinks this is a great opportunity – since he’s got a plan for how they can take over the entire galactic empire! Since it’s pretty obvious that he’s going to be around for a while, I headed over to the good people at Wikipedia and asked them about the Mekon. It seems that he’s the leader of an evil race of aliens called the Treens, who hail from Venus. Apparently he was Dan’s main villain, so him showing up here is like the return of Sivana or Lex Luthor. It’s weapon demonstration time in West Germany, as Probe, Sharpe, and a group of generals gather to watch a new laser tank in action. The American general brags about how his new invention is going to make supermen like Probe obsolete, which is the kind of hubris that tends to be punished quickly in comic books. The tank swings its laser turret around and kills a few generals, but Probe is able to save Sharpe and the American. The tank then turns and heads for the border – it’s being piloted by Russians who are trying to get it to East Germany! Probe runs after it! It seems like a crazy plan, but Probe knows the tank’s weakness: it can only auto-target metal objects. He strips out of his track suit and charges after it, knowing full well that he’ll be moving too fast for the gunner to manually aim at him. They fire wildly, exploding trees and starting fires, but Probe presses on, undaunted. Just before the tank gets to the border Probe manages to jump on top of it and tear open the hatch. He kills agents inside and drives the tank back to the NATO base. The American general is so impressed that he asks if the American government can borrow Probe some time. 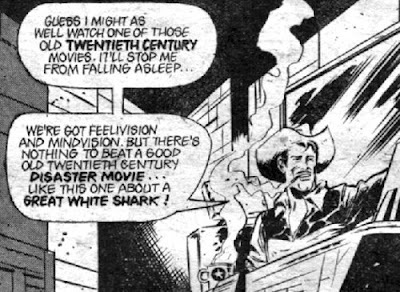 This is the second time I’ve found the plot of a MACH 1 comic really familiar, not counting the time he played Samson. The whole business with the futuristic tank being stolen from a NATO demonstration in West Germany reminded me of a punisher comic from the 80s. A quick trip to the internet revealed that it was Punisher War Journal #10 I was thinking of, although that time it was a helicopter being stolen, and Frank Castle used a tank to stop it. Oh well, close enough. It’s all-out war with the robots! As people are warned to stay indoors, the judges are out battling the machines with everything they’ve got! Meanwhile Call-Me-Kenneth is preaching revolution to his robot hordes! Some success has been found by walling up the robot-intensive areas with steel barriers, but the war is taking its toll – a hundred and four judges have already been killed! 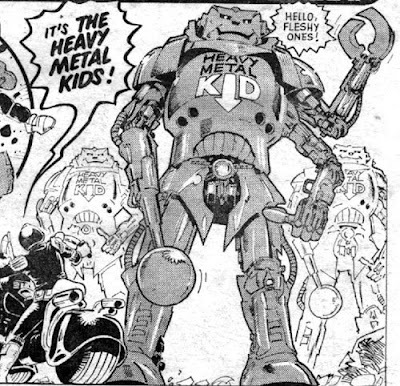 Suddenly the street where Dredd has stopped starts to shake, and one of the barriers is knocked to pieces – by giant wrecking machine robots, the Heavy Metal Kids! The HMKs, being nearly indestructible monsters, lumber forward along the skyway, making quick work of the fleeing judges. Dredd hasn’t given up, though, and by spinning his bike in tight circles at the robots’ feet, he tricks them into smashing the walkway out from under themselves! The robots fall to their death, and Dredd collpases from exhausition. Dragged back to his apartment, Dredd is tended to by Maria, his racist-stereotype-of-an-Italian cleaning lady. Last time I’m pretty sure she was his landlady, but maybe I’ve got it wrong. Dredd rankles at being coddled, though, and announces that he’s going to take the war to Kenneth. Judge Jack exclaims that it’s impossible – a hundred judges couldn’t get into the robot-controlled area! Dredd announces that not only is he going to kill Ken, he’s going to do it alone! Now that’s how you write a cliffhanger! No kills for Dredd again this week, so he’s stuck at 19. The dateline gives the year as 2178. So in just 201 years, there have been ten more Queen Elizabeths? That suggests a situation where each reign lasted only 20 years, and that's only if each queen had the same name. Well, either that or there was another Henry VIII-type figure in the late 21st century who kept having his queens beheaded, and only married women named Elizabeth. Best Story: Judge Dredd – Fantastic forward motion on this whole Robot War thing has got me enthralled. I only wish that the art here had been considered good enough to be reprinted in America, so I could have seen this years ago! Worst Story: The rest of the stories were totally competent this week. 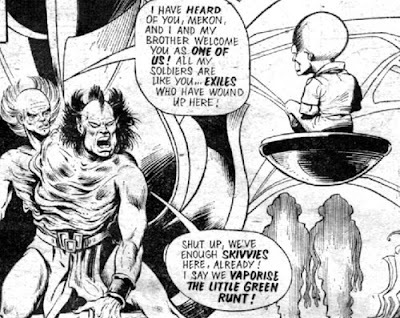 Even Dan Dare re-introduced his arch-nemesis and promised a galactic threat, so I can’t complain.